Thomas 'Twm' Jones: But pawning a harp at any time - there's immorality for you. 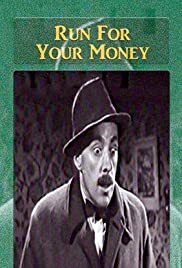 A lesser-known, lightweight Ealing Comedy which follows the exploits of two Welsh mining brothers Donald Houston and Meredith Edwards who win a newspaper lottery prize of a trip to London, tickets for the big England v Wales rugby international at Twickenham and £100 prize money each. Sent out by the paper to chaperone them on their big day and write up their story is their reluctant, horticultural columnist Alec Guinness but almost immediately they arrive in the big city, the siblings are separated and fall into a separate series of misadventures before they have to make a madcap race for the return train home with a motley entourage in their wake, who've all played a part in their story. A tale of innocents abroad, the film one suspects is mildly patronising of the Welsh as rather wide-eyed, boozy, over-trusting simpletons who sing their way through life's ups and downs. Houston's Dai and his solo adventure is more interesting than his brother's as he falls under the influence of what Guinness's character neatly calls a pro-con, pretty professional confidence trickster Moira Lister, out to separate Houston both from his money and his girl back in the valleys. I however found other brother Tom's escapade, where he picks up his old hometown harpist accompanist begging on the streets of London, rather tiresome. The film has some funny moments like when a tannoy announcement is made for a Mr Jones from Wales at Paddington Station when the announcer can't pronounce their Welsh town name to a train full of Welshmen arriving for the match, with predictably chaotic results and a young Joyce Grenfell's turn as a fawning dress shop salesperson but the film suffers from too much slapstick and sentimentality. Houston and Edwards hardly seem like brothers and Hugh Griffiths as the hanger-on harp player soon irritates but Guinness already shows the skills that would make him a mainstay of the studio in years to come. Lacking the sharp satire and social commentary of other Ealing Comedies, nonetheless I can see how this unassuming film might have cheered the average post-War cinema-goer. Me today, a bit less so.